Guitar -> Volume -> Compression -> Pitch -> Distortion -> Modulation -> Reverb -> Delay1 -> Looper -> Delay2 -> Delay3 -> Delay4 -> Reverb. So this will let me have a Reverb and Delay in front of the looper. I know this is a challenge to get a clean loop with delay and reverb on it, but I wanted to set it up to try. And having reverb in front of delay, at the beginning of the delays, is a twist that I want to experiment with. Another thing: I figured out that I ran 100mA power to the Nemesis when it requires 200, and it just flat conked out. It would pass the signal through it when the pedal was off, but when I hit the on switch, it just killed the whole signal. Nothing came through. That's why I labelled all my power lines coming out of the Pedalpower. I guess turning the board upside-down and trying to figure out which power line was which, was not a fool-proof effort. The labelling is brilliant. Also, maybe because I under-powered the Nemesis, I dunno, maybe I damaged it. It's been flaky. 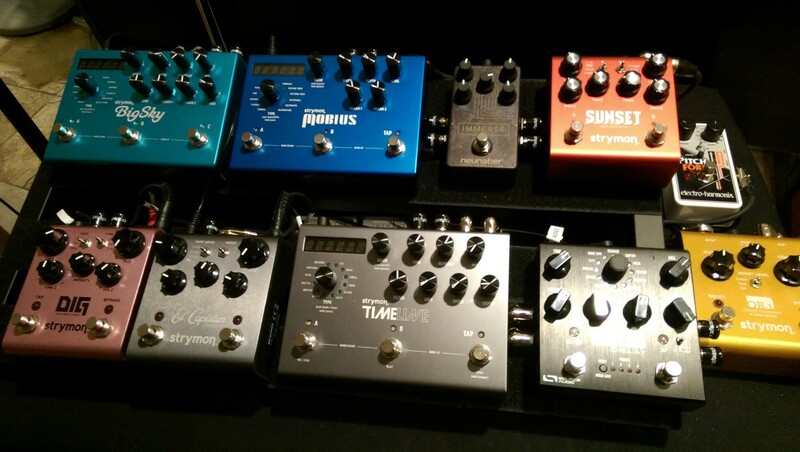 When I got the board all together, I had a constant high pitched warbly tone. I checked cables, everything. Finally, I isolated it to the Nemesis (should have looked there first). I figured it was the power again. So I plugged it into a Strymon provided (very good) power bar and it didn't fix it. Then I put the original Pedalpower cable back into it, and voila, no more noise. What the heck? Didn't make sense. So basically, all I did was take the power out and put it back in. Of course I had tried that umpteen times. It seems to be working fine, but I'm suspicious of that Nemesis until proven innocent. Time will tell. But taking all the pedals off the board, then just looking at them, was a very good exercise to see where I really wanted each one! For instance, I now have stereo all the way from the modulation (Mobius) pedal forward; before that I went mono out of the modulation. More stereo! Plus it all looks neater and tidier.